Our versatile custom die cast medals in a 3.5" size are perfect for athletes, students or customer appreciation and unique custom promotions. Each custom medallion is created to your design and plated in your choice of bright or antique finish and can also be color filled. 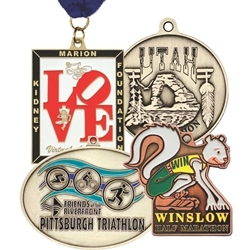 Medals can be designed around the shape of your logo or round. Upload your artwork and we will email you a free proof with 1-2 concepts for your approval. Minimum quantity of 100 pieces for this item (finishes may be mixed to obtain discount). Please allow five weeks of production time before item ships. Contact Us for a free proof and quote.